That’s a whole lot of Gr8ness in the title, don’t you think? Ok, ok – I apologize for the pun. I whipped these up using the open source Gource visualization software and with HD content free on Youtube now, I just had to try that out too. 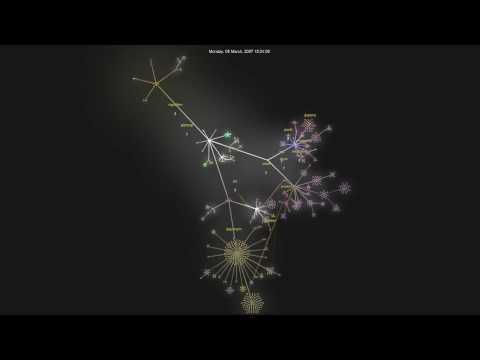 Gource is a software version control visualization program with support for Git, Mercurial, and with a tiny bit of extra effort, CVS and Subversion. It’s available as a macport install, as is the ffmpeg program used to stitch together a series of screenshots into the final video. 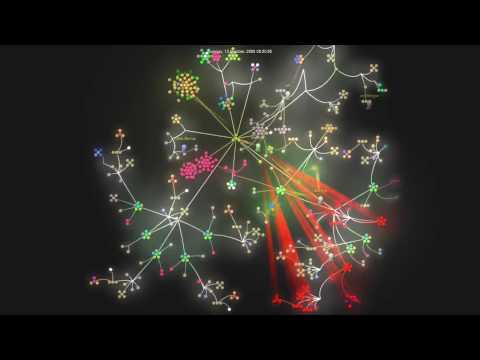 All of these visualizations were created with Git or Git-svn. When the Gource program is running it brings up an interactive window so you can interact with it to a degree, affecting the camera, zoom, etc. The default resolution is 1024×768 but I tried to bump it up to 1920×1080. I’m assuming that stretched the limits of the rendering, as there’s quite a bit of pixellation in the final product; either that or the ffmpeg params need to be tweaked. The three visualizations on this page were all created using this one-liner command line invocation (broken down here over several lines for readability). From the initial commit on August 28, 2003, Groovy has come a long way. I tried the Gource provided python script to translate an svn log file into the required format the first time, but cloning the repository with git-svn seemed to produce better results. It’s interesting to see that the overall structure of the Groovy project doesn’t look like is has changed very much over the years. I recognized a lot of the names you see on the screen. Be sure to watch the 1080p version if you’re having trouble reading the text and see if you can’t find some recognizable committers. Starting on Sunday March 14, 2004 here’s how it all unfolded, at least from the perspective of the public Git repository. Grails looks like it grew a little more spontaneously than Groovy; there are more frequent restructurings and some transitions that seem to cover a whole lot of ground in very little time. In particular watch out for the burst of activity in the summer of 2009. September 17, 2008 marks the first commit for Griffon and this short but sweet video explodes right from the start. Benefiting greatly from the Grails model this project shows a lot of progress in a very short time indeed. Most, if not all, of the names you see here you probably caught in the previous two videos as well. Watching these gives me (and maybe you) some appreciation for how much effort over time it takes to bring a new language/framework/technology to maturity and all of the individual contributions that go into it. Gource provides a lot more detail into the actual structure if you want to dig in. For purposes of keeping these images fairly uncluttered I removed file and directory names and just focused on the committers and the general structure. I think I gained a git of insight into how a codebase can evolve, and properly appreciate that organizing the increasing complexity of an ever-growing system over time is not a simple job. Plus they look cool. Enjoy! Awesome! Well done, I love visualizations! Thanks very much to YouTube! These videos have been served up collectively over 700 times in 3 weeks for a total of slightly more than 3GB of data transfer that I didn’t have to pay for. To put it in perspective that’s more bits than this site has served up in a year.